Red Coat, Gray Outterwear Accessories and a Labour of Fashion. Welcome to the second week of a Labour of Fashion. I am co-hosting again with Linda this week. 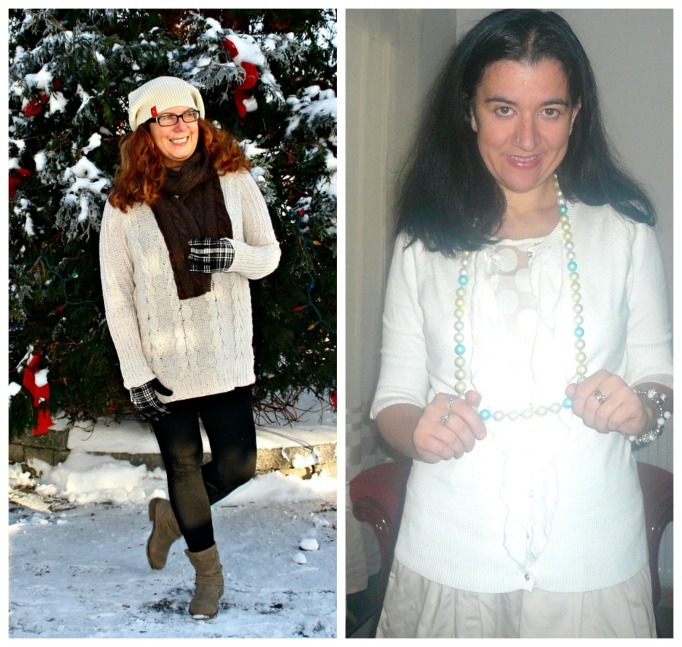 Thank you to all 37 of you Fabulous Ladies who joined the link-up last week. You can check out Linda's Outfit from today here. I am doing something I don't do often and show you my Outterwear. Linda always shows us a lot of her wonderful coats and cute Winter accessories. I paired my short Red Coat with some Fun Gray Winter Accessories: a Bow Gray Fedora, a Gray/White Woven Blanket Scarf and some Gray/Orange Space-dye Gloves. Bright Red, Double-Breasted, Waist-length Coat: A Boutique in Albania (similar gorgeous option by Tommy Hilfiger, best deal), (similar, longer length by CK, great deal, love this), (similar w/ toggle buttons by Tommy Hilfiger, on sale, love this). Heather Gray/Charcoal/White Large Buffalo-Print Woven, Blanket Scarf: A Boutique in Albania (New) (similar gorgeous option, great deal, love this), (gray/silver textured option by BR, on sale, love this), (similar gray+black check option, best deal). Gray+Bunt Orange Space-Dye Knitted Gloves: Meijer's. Off-Black, Soft Velvet, Skinny Pants: Martin & Osa (very similar by Gap, best deal, love these), (similar ultra skinny option by Paige Denim, on sale, love these), (similar by Ralph Lauren, great deal). Teal Green, Faux Alligator Bag w/ Camel trimming: A Boutique in Albania (similar in perforated leather by Neiman Marcus, best deal), (gorgeous 2-tone tote option by Neiman Marcus, great deal, love this), (gorgeous option w/ locket by Melie Bianco, love this), (similar turquoise option by Coach, on sale, love this). go meet some new friends! 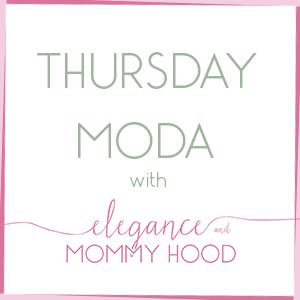 My lovely Co-Host Ada blogs over at Elegance and Mommyhood, where you can always count on seeing a lovely outfit and sometimes even a few mommy and me posts. Her lovely daughter Vivian ( who will be two very soon). I am so thrilled to be sharing my first link up post with Ada, she is the blogger we all aspire to be, that one who always has a kind word to say on your post and lets you know that the work you have done really does matter. P.S. Also, linking up with Allison, Elle, Jalynn, Jen, Jenna, Jenna Marie, Jolynne, Lauren, Little Friday, Rachel, Shannon, Tara and Vicki. I am also linking up with Whitney for Take One, Pass it On. She wore some Gray in last week's outfit which I passed into my outfit, today. Red Plaid Holiday Dresses - Mother and Daughter Edition. Hello and Happy Hump Day! This is the Plaid Dress I mentioned yesterday which I wore to a Holiday Party (for the training center I teach at) a couple days after Christmas. I love that this Dress looks like a Plaid Peplum Top and a Black Mini Skirt. I really wanted to wear bare legs and some Black Pumps or Black Stilettos with it but it was a super cold evening (below 0 Celsius) plus windy and very rainy so I opted for Opaque Black Tights and my Dressy Black Leather Boots keeping the look Monochrome with the black skirt part of the dress. I accessorized with a couple of Pearl+Crystal Bracelets my husband gave me for Christmas, my Heart Statement Necklace, Red Bobble Studs, a White+Silver Cocktail Ring, a Light Smokey Eye and a Wine Lipstick. I really wanted to curl my hair but the weather was against me that day so I just added my Swarovski clip in a half ponytail and I was done. Since Vivian wore a Similar Red Plaid Holiday Dress a few days earlier (the same Dress that she wore for our Holiday Photos this year) I figured I show you a Mommy+Daughter post featuring both of our festive Red Plaid Dresses. Hope you don't mind. Of course Vivian steals the show as always. Do you own a Plaid Dress? How are you wearing it this Winter? I found many cute options similar to my Dress - linked below. 3/4-Sleeve Fitted Dress w/ Red Plaid Peplum Top & Black Mini Skirt: A Local Boutique (New) (similar, gorgeous option by Trina Turk, love this), (similar, fitted, red peplum dress, on sale, love this), (red plaid, fit+flare style, love this), (similar, retro-inspired, great deal), (magenta+pink plaid option, best deal). Red, Double-sided, Bobble Earrings w/ Large Pearl on the Back & Small Crystal on the Front: c/o Viggos (New) (double-pearl ones by The Limited, love these), (similar w/ pyramid pave side by Sam Edelman, great deal, love these). 2 Dainty Sea-pearl & Lavender Crystal, Silver Bracelets: Christmas Gift from my Husband (from an Etsy shop). Red+White, Envelope-shaped Cross-body Bag: A Local Accessories Boutique (New) (similar, best deal), (similar, red + tan, great deal), (similar, Kate Spade option, on sale, love this). Pointy, Black Leather, High-Heel, Tall Boots w/ Buckle Detail: Worthington (JC Penney's) (similar by Rockport, on sale, love these), (similar w/ wedges, great deal, love these), (similar, fantastic deal, love these), (riding style option by Hush Puppies, on sale). Red+Black, Holiday Sleeveless Dress w/ Tulle underneath: Tres Jolie Kids. White, Long-Sleeved Onesie: Babies R' Us. Charcoal Gray, Wool-blend Leggings (part of a 2-piece set): Macy's. Silver Crystal Beaded (very) Long Necklace (my necklace): White House Black Market (very similar, great deal), (gorgeous option by Chico's, love this), (similar by Charter's Club, best deal, love this). Red Bow Hair Clip w/ White Stars: Random Street Vendor. Red, Velvet "Hello Kitty" Booties: Christmas Gift from her Grandma. P.S. Linking up with Alice, Ayana, Carrie, Elizabeth, Erica, Jenna Marie, Leeann, Lisa, Liz, Robyn, Sarah and Tameka and Victoria. Make sure you check yesterday's plaid post because I featured some of your looks! Also, come back tomorrow to link up with myself and Linda from A Labour of Life. It is the second week of "A Labour of Fashion".